Another option is to take the Montblanc Tramway from St. Gervais Le Fayet that goes upto Nid d'aigle. It stops at Bellevue on the way. There are beautiful views over the valley from Nid d'Aigle also. 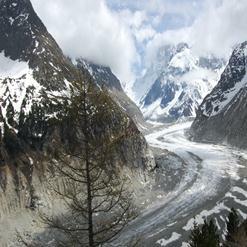 It offers a spectacular sight of Mont Blanc and Mont Blanc tramway makes it awfully famous with sightseers.